I had fun doing performance tests after reading an article which had performance tests for Python. I wanted to only test web back-end tech, but I still added in a test with C in order to compare everythig else with a low-level language. And the winner is... GO ! PS : Go here is 9x better than than C, but with good optimisation flags, C is faster. My machine is Core I3, 8GB of RAM, SSD of course :) It took 7 - 8 seconds with Python and 0.02 - 0.12 with Node.js But the most interesting thing is when I change 100 mils to 1 bil, Python consumed the whole memory and then printed "Killed" after about 1 minute, while Node.js returned the result within only 0.853 sec! Using python's range while using for() in other languages isn't fair. In python either use simple while loop or xrange. Louis C optimizes the loop into a simple formula, so it does not run the loop. 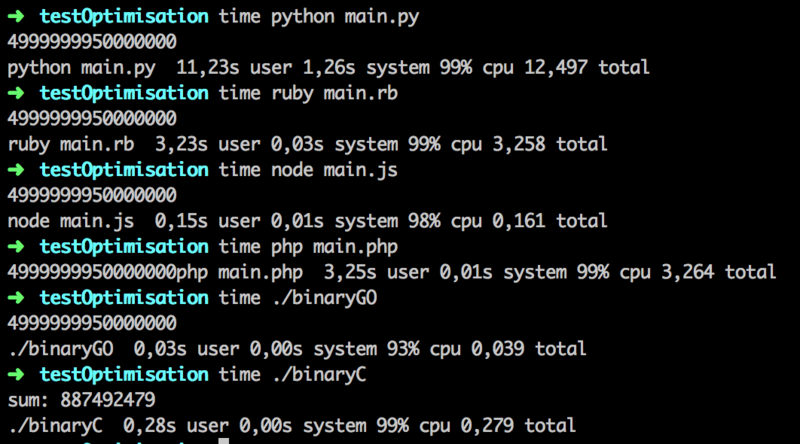 Yes, the Python performance is standing out, isn't it. I heard it has that reputation, i.e. that one shouldn't use it if performance is a big requirement. Glad to see Node doing so well. Out of curiosity, what happens if you run the Python version under PyPy? You can write more elegant Ruby code (and it should be faster too).